What makes an organization "digital"? A radically simplified customer experience, intense end-to-end collaboration and, a fast value stream. But to reach this point, one needs to understand customers, experiment quickly and teams working together. In a large bank, centralized agile dev teams deliver Apps and solutions every 3 weeks to teams in various countries who integrate them to their respective local systems. At best, the local teams integrate the new apps only twice a year into their new versions. – Convince local teals to accelerate production releases pace. – design the content of each sprint based on the users’ feedback. The challenge was twofold: first understanding the actual situation of the projects, and then align the objectives on the global business strategy. The teams also realized that the vision of the business analysts did not always exactly match the users expectations. They agreed on sprints that precisely match the immediate customers expectations. We are Lean IT experts, in those articles here and there on InfoQ you will learn about the obeya through examples and illustrations from the IT world. A fintech, worldwide leader in its sector, must reduce both the number of bugs in its application and the resolution time. The Head of R&D asks Operae Partners to help the teams secure the next delivery of the application. – fast experimentation and problem solving by every engineer. 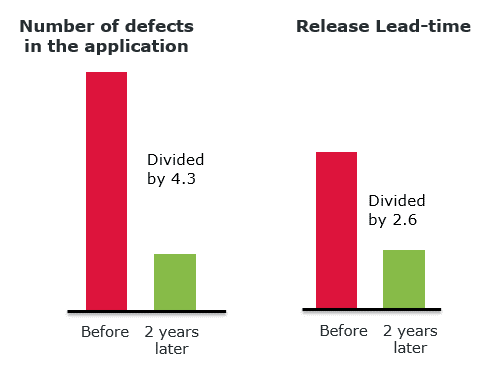 Two years after the initial project, the teams keep doing Lean and the results speak for themselves: the number of defects in the application has been divided by 4.3 and the release lead-time by 2.6.